Plan Your Escape® World Travel Adventures - Unhook Now... for Life! : Dunlaps' 5-Star Groundbreaking and Comprehensive How-to World Travel Book - Ebook for Only $7.96! Travel for half the cost for all levels of travel from budget to luxury and 100's of other unique travel tips for all trips from weekend getaways to longer vacations, trips, or living somewhere for awhile! From a former Economics professor, experienced traveler (100 countries), award-winning photojournalist/blogger, featured speaker at large travel shows, travel TV host (Plan Your Escape® TV), and travel columnist for the Huffington Post, turn your travel dreams into reality with this acclaimed, groundbreaking, and inspiring how-to travel book. Available as paperback or as Ebook for $7.96 on Amazon or $8.35 as B&N Nook Book, you will learn to safely realize and afford your travel dreams with comprehensive planning tools and checklists. You deserve this 5-star rated book! It also makes for a great gift that keeps on giving. Former Economics professor and experienced world traveler (100 countries) tells 100′s of powerful cost-saving tips revealing proven secrets the travel industry does not want you to know! Learn to get the best deals on airfare, hotels, tours, cruises, tours, car rentals, restaurants, and more. Experienced and occasional travelers say Plan Your Escape®, Secrets of Traveling the World for Less Than the Cost of Living at Home is an inspiring and comprehensive how-to travel book: “It gets people exploring possibilities they never thought of.” – see Book Reviews and 5-Star Customer Ratings on Amazon.com and Barnes & Noble! Give yourself, friends, and family the gift of affordable travel. 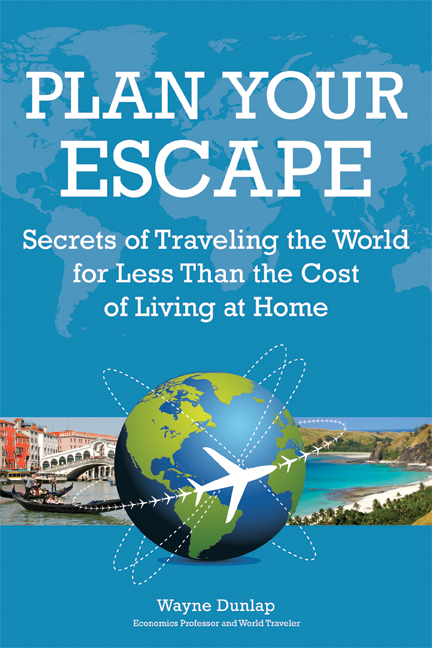 For additional information, click on: Groundbreaking & Comprehensive How- to World Travel Book - "Plan Your Escape®"